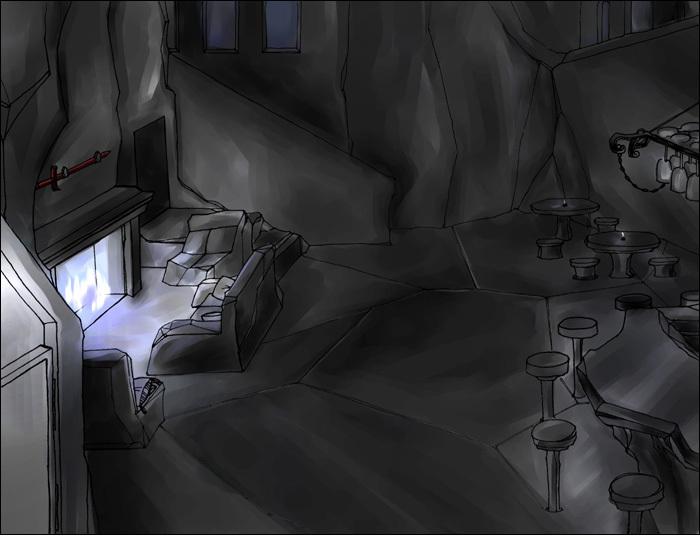 Exodus Night Tavern is an extremely large two story tavern made of black obsidian stone. There is a large common room, with stone chairs and seats with comfortable soft cushions upon them. You would see couches in front of the windows and in front of the full wall fireplace that reaches to the kitchen door on the right side of the room. On the east side window facing the store fronts there is a stone window seat. There are dark passages that the undead use to reach the tavern from the Eastern Transian forest. Many other passages can be found upstairs as well as under the common room. Only two or three of these passages have been found, more exploring might uncover additional hidden rooms and passages. As brutal as he looks, his cooking is of the highest cuisine standards; after all he was the cook for Lord Marlak. The fires within the tavern burn blue, and they are said to have some magical abilities. Food and drink is free, tips to the serving girls is appreciated. As you walk out of the tavern you would see a huge courtyard with seats and a statue of the King of all Gods Lensen. This statue has an everlasting crown, where the soul of Lord Alexander is harbored, and a full water fountain on the bottom. Walking to the right you would see a beautiful aqua colored waterfall pool directly after Ruskin's forge. Sembryn Falls flows within this pool, where people gather to picnic or talk. Sitting in the tavern you would hear the rushing waters of the waterfall, a very soothing sound.